We are pleased to have hosted five intrepid educators in our Dumpster home over the spring and summer. Educators working with any grade level or type of educational organization are invited to stay in the Dumpster through our Home School Residency Program. 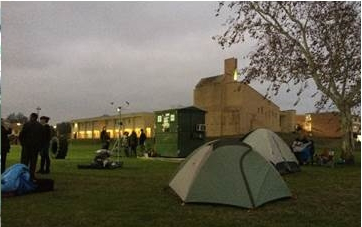 During the residency period, educators stay in the Dumpster home for one night to a week. The stay could be framed as a personal sustainability experiment, a hook to engage participation in a schoolwide environmental challenge, a spark to student brainstorming in the classroom, or anything else a creative educator can imagine! The educators who have stayed with us thus far – Betty Jenkins, Anthony Jefferson, Diane Bertotti, Patrick Benfield, and Brad Melius – put their dumpster time to use in ways that reflect their personal missions as educators. Betty Jenkins, Principal of Blackshear Elementary Fine Arts Academy, has led her east Austin school through a successful transition from elementary school with a standard K-5 curriculum to AISD’s first elementary fine arts academy infused with arts-based academic enrichment and integrated multidisciplinary learning. She has been a supporter of the creative Dumpster Project approach to science education since our inception, and helped us develop our interactive inquiry-based Dumpster 101 science curriculum at her school. Fifth grade Blackshear science classes now experience a Dumpster Science sequence every semester. Principal Jenkins was actually our first Home School Resident, and she kicked off the program in style! Teachers and staff from Blackshear EFAA camped around the dumpster sited on the HT soccer fields. Read her reflection on the experience, including close encounters with our campus wildlife! Betty Jenkins accepts the ceremonial dumpster padlock (left) as her teachers set up camp around the Dumpster on the HT soccer fields (right). Anthony Jefferson is Superintendent of the Alpha Charter School in Garland, TX. Mr. Jefferson learned about the Dumpster Project during a visit to the Huston-Tillotson campus where he toured the Dumpster itself and learned about our formal and informal education programs. He immediately connected to the potential of an inspiring challenge – like turning a dumpster into a workable living space –for motivating student achievement . Alpha Charter’s vision of student success centers on structure, direction, nurture, and intrinsic will. Mr. Jefferson demonstrated his commitment to inspiring his students by staying in the dumpster as a kick-off for sustainability learning at his school. Listen to his thoughts about the experience. Diane Berlotti is a logistics coordinator and youth mentor for the TEDxYouth program based in Austin. Teachers, parents, community members, and other Tedx Youth volunteers spend months planning the annual day-long event for high school students. This year, we were invited to share our perspective on the conference theme of in(visible). The Dumpster Project brings invisible environmental impacts to life, literally bringing them home to make them visible. Students attending TedxYouth were able to visit the Dumpster, which was on site at Westlake High for the event, and hear from Professor Dumpster. Diane spent the night so that she could experience our unique sustainability experiment first hand. Anthony Jefferson prepares for his stay while Basuereo Bonnie looks on (left). Brad Melius deploys his dumpster-friendly portable bike (right). Patrick Benfield is STEAM director for St. Gabriel’s Catholic School in Austin, Texas. Benfield, a long-time maker and builder, brings the imagine-design-build philosophy of the maker movement to life in his STEAM student programs. The open-ended nature of the Dumpster Project appealed to his tinkering style. Patrick has seen firsthand how design-based tasks harness student creativity and forge critical thinking ability. He plans to use the challenge of “starting with an empty box” to inspire his learners over the next school year. Patrick’s dumpster stay also served as a kick-off for a week long series of Earth Day events at St. Gabriel’s. Hear about his experience in an interview with Dra. Basura here. Brad Melius visited us from the Pacific Ridge School in Carlsbad, California, where he teaches physics in the middle and upper school programs. Brad is taking a radical (and dumpster-worthy!) approach to add an ecological perspective to Pacific Ridge’s emphasis on ethical responsibility and global awareness. He will work with 11th-12th grade students in the Pacific Ridge STEAM program to design, build, test and refine a tiny house on campus over a year and a half long course series. Brad intends to live in the house after the courses, marking an admirable high point for confidence in student work! Brad came to Austin prepared to embrace the Dumpster Project way; he brought his own carbon-zero transportation in the form of a foldable bike. Hear about his experience Inside the Dumpster Studio here. Can you tell these people are in a dumpster? 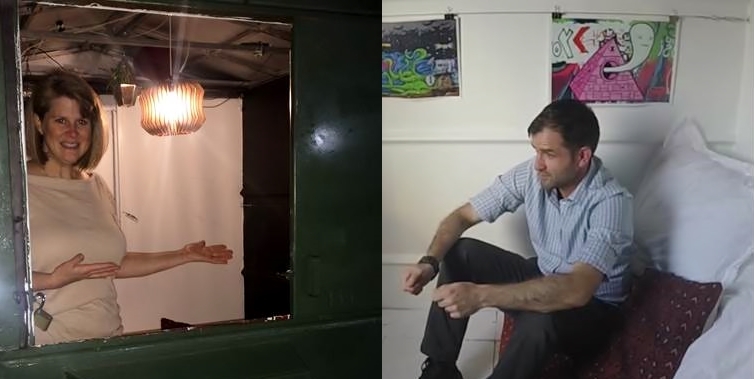 Diane Bertotti shows off her cozy digs (left) while Patrick Benfield relaxes inside the dumpster studio during an interview (right). We’re excited for the start of the 2015-2016 school year and ready for more Home School Residents. Contact us if you or an educator you know might be interested in a Dumpster stay.